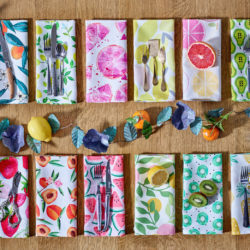 You all may remember Lizzy House, one of the participants in our Celebrity Fabric Design Smackdown a couple of months ago. She's a young textile designer who not only took it upon herself as a college student to figure out how to break into the industry, but who also took it upon herself to write and publish a book afterward explaining to other designers how to do the same thing. 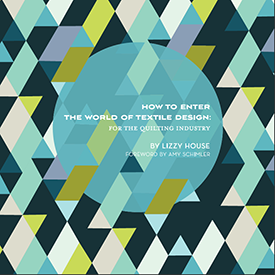 Her terrific ebook How to Enter the World of Textile Design: for the Quilting Industry can be purchased from a link on her blog. 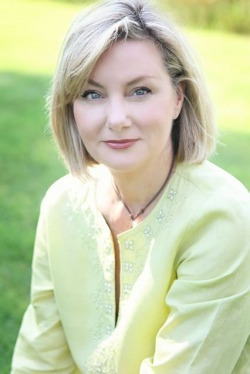 Because the ten Project Selvage finalists are starting work on the collection portion of the design competition, we figured that today might be a good day to share Lizzie's advice on creating collections as well as some of the guidance that Kathy Miller of Michael Miller Fabrics offered to our ten finalists. I make a check list (go figure), and build around it. This list helps me stay on target so I don’t get lost when I get in the middle of things, and can’t figure out what’s missing. * key/main. This meaning the piece that all the pieces in the collection revolve around. Interestingly enough, the key piece generally doesn’t sell as well as the supporting pieces. * dot. The dot is generally an all over pattern, like a polka-dot reinvented. * stripe. Pretty straightforward, the stripe is a stripe. 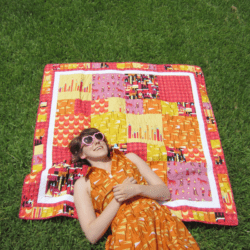 Stripes in quilting are great for creating multiple directions in quilts and projects by using only one fabric and changing its direction when you cut and sew. * organic pattern. Organic patterns are just as they sound. Organic. Organic shapes are shapes that you would find in nature. This does not automatically mean flower. I tend to think of it more as something that happened on its own. * geometric pattern. Geometric patterns are never as simple as they look, in fact the more simple something is, generally the more calculating there is involved. Again, they are important in quilts and projects for structure. * large scale repeat. Repeats happen in divisions of 24 inches. The pattern design doesn’t have to be huge, in fact it can be small, but in a large scale repeat, there’s just more of it. So it only reoccurs 4-8 times in a yard. It makes it special. * varying scale. This is just a friendly reminder to check your scales. Do you have a large pattern? Do you have a medium pattern? Do you have a small pattern? Do you have patterns that fit in between? * varying value. Again, a friendly reminder about value. Do you have a dark valued pattern? A medium value pattern? Do you have a light valued pattern? And values in between? This list is not concrete. In fact, I generally don’t use it literally. Although, sometimes a stripe is just a stripe. I like to think of pattern designs taking on the roles of these characters. A flower acts as the dot, vines act as stripes, a grouping of trees performs nicely as an all over pattern, and something ornate takes on the organic, while some heroic diamonds are called in last minute for some geometric contrast. Ta-da! Now, if you are casting these supporting characters, around your star, your key piece, and using these nuances as variations, creating a cohesive whole with continuity, and contrast should be a clear-cut task. Also bear in mind that some patterns will double up on this list. 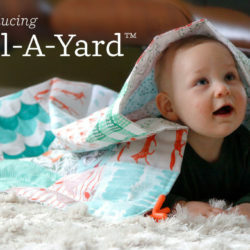 An organic pattern is also a large scale repeat, or dot is also a geometric pattern, and so on. If you make and follow a list like this, then you can avoid any redundancies. Also, don’t throw a piece in just for the heck of it. They always stand out. They make it seem like you were confused, and then in turn the manufacturer was confused. Be clear and concise with your vision. The collection each finalist submits should consist of 6 patterns in total. The winner will also be asked to develop a "Baby Girl" collection by the beginning of June. Each pattern should stand on it's own as well as with the group. The group needs to be tightly edited both in color and design. If pieces in the group look redundant it will cause the buyer to pause and start eliminating. "If we don't do the editing the customer will." The reasoning is that most buying decisions are made on impulse. It's a split second decision. You want the customer to look at it and say: "I want it all!" One of the things that sets Michael Miller apart is that we don’t necessarily set rules and parameters when putting together a collection. We try to be diverse and innovative when putting designs together. Collections don’t always have to be the obvious match of color and design. We look for designs that work when sewn together in a project. 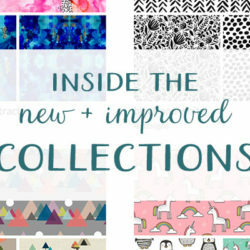 These are great guidelines for creating collections! Thank you!